US consulting, market data and technology firm Jordan & Jordan has chosen to launch its execution compliance and surveillance service on Nasdaq OMX FinQloud, the cloud computing platform built for financial services and powered by Amazon Web Services. 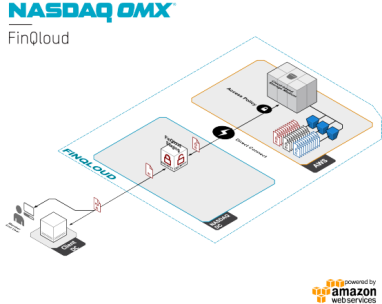 Launched in September 2012, Nasdaq OMX FinQloud was designed to allow users to store their financial data cheaply and securely, so that they can meet regulatory requirements more easily. Nasdaq OMX’s solution consists of two parts: Regulatory Records Retention, also known as R3, and Self Service Reporting. R3 is a storage and retrieval tool designed to help broker-dealers meet US Securities and Exchange Commission rule 17A-4, which requires broker dealers to preserve electronic records in a non-erasable format for a minimum period, between eight months and six years depending on the record. SSR is built to help broker-dealers to carry out analysis and reporting on their stored trade data. The cloud solution includes infrastructure data management, virtualisation and hosting, and accepts data from Nasdaq OMX as well as other sources. New York-based Jordan & Jordan is a consulting, market data and technology company. Moving its execution compliance and surveillance service to Nasdaq FinQloud is intended to give the firm the chance to expand its analysis capabilities and scale data storage more economically. FinQloud will host the Jordan & Jordan service as it manages trade and quote data, provides storage and retrieval of reports and records and allows access for inquiries and auditing. Jordan & Jordan has said that it expects to significantly reduce its costs through using the platform. Customers of the service will be able to analyse their stored trade data without maintenance costs associated with daily data transfers. Jordan & Jordan is one of 19 customer firms currently using Nasdaq FinQloud. The previous addition to the service was broker Tradier, which joined in June with the aim of building a ‘cloud brokerage in a box’ service for clients. Start-up financial analysis company Kenshō is planning to become the first professional analytics platform built completely on Nasdaq OMX’s FinQloud cloud computing platform, which is powered by Amazon Web Services.